For any interview to return valid and viable results you need far more than a good list of questions. The sum total of research and practice aggregated and presented at the last 13 world International Investigative Interview Research group conferences by academics and practitioners show unequivocally that you need planning, structure, agility and execution. We are the only Australian company to update our programs with the content obtained by our people attending these conferences. We are the only Australian company to be asked to present at these conferences. We are the only Australian company to take this information and develop the country’s first, fully validated non-law enforcement interview framework. We are the only Australian company to integrate the latest research in Psychology, Social Neuroscience, Psycholinguistics, Micro-expressions and Personality Theory into contemporary interview methodology. We call it PROSPECT – an anagram that defines the search for something valuable. It is designed to work for job interviews, performance assessments, conflict resolution, coaching, customer service, business process analysis, consulting, clinical assessments, counselling and financial planning. It works equally well for workplace investigations, compliance regimes and security functions. Although there are many different aspects to gathering information from others and many different types of interviews, at their very core is something very similar. Regardless of the context, poor interviewers make the same mistakes and successful interviewers do the same things right. They just manifest themselves differently because they are in different contexts. We believe that in any interaction between two human beings where there is some need to engage and obtain information for a professional purpose, it’s an interview. An interview is nothing more than gathering information for a specific purpose. Interview is everywhere. We do it all the time, at work and at home – we just don’t see it as an interview. 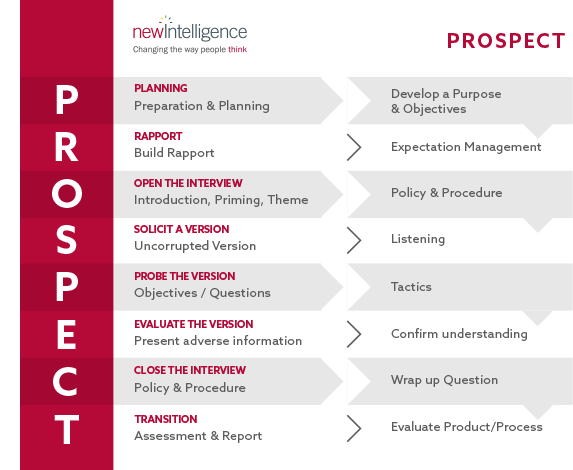 So we developed PROSPECT – the context agnostic interview framework to help anyone, regardless of their level of capability or personality, their job or the importance of the outcome to become better at gathering information from others.. The word PROSPECT itself developed out of the need to develop each of the components of the model. If you are prospecting for something, you are searching for something valuable. But you don’t always find what you are looking for and often you must sift through a huge amount of material with little or no value to uncover the gems. We didn’t set out to develop an interview framework. We did, however, set out to try and improve what we would call a “technical” skill based on our understanding of human interaction. Our specialty is trying to understand how the brain and, subsequently, people function specifically in the context of an interview. This is where we first started to question some of the “official interview” paradigms and models. We soon realized that, other than in law enforcement, there wasn’t any consistently applied model or framework when it comes to conducting interviews. The big realization for us was that interviewing is so pervasive in both professional and home life—yet it has no universally recognised framework. The more we looked, the more we found that success in areas as broad as business analysis, healthcare, financial services, government and even private enterprise is oriented very strongly towards your ability to gather good information from people, rather than to provide it. This also rings true with many functions like sales, service, management and leadership. Planning: In our experience, one of the most overlooked things in interview is the planning. When we look at the amount of time spent in an interview, a significant part of that should be in the planning phase if you want to achieve a strong result. Rapport: The second most misunderstood and underutilized area of interview is the building and testing of Rapport. This is an area where we differ from most other models. Rapport is not about liking people or making someone feel comfortable. For example, there’s a very clear difference between rapport and empathy, or rapport and sympathy. Opening: The O then is about opening the interview, another area that’s often rushed and underdone. This vital setup for the interview saves you a lot of time and effort later—if you do it right. This is where we have introduced the concepts of expectation management, developing themes and uncorrupted version questions and things which, psychologically, set up the interviewer and the interviewee for a robust and open conversation. Solicit a Version: Solicit a version is about getting what’s called the free narrative. This is crucial in terms of what we call “tramping on the memory.” Every time we get someone to recall something, we contaminate the memory. So, the fourth or fifth time that you get someone to tell a story about something, it is actually not a correct account of what’s happened. Probing: Once you have opened up the interview and obtained a story, it is vital to then probe that story and check it. This is an area where many interviewers fail. They obtain one version and then accept it on face value, with no testing or detailed probing, not even a curious interest. The idea that all an interviewer needs to do is ask a bunch of questions is what makes it difficult for people to be consistent. Evaluate: It is important to evaluate the information you get because of probing the finer detail. That’s where we seek out the anomalies or gaps in the information and fill in those gaps. We can’t fill in those holes unless we deliberately look for them. At this point in the evaluation process, if a client is going to lie to you the only responsibility you have as an interviewer is ask the right questions to force them to the point where they have to actively lie rather than passively lie. The mistake many interviewers make here is pushing for “the truth” as prescribed by the interviewer. They look for their truth, rather than focusing on accurate, relevant and reliable information. Closing: Just saying, “Okay, thank you,” and walking away from the interview fails to take advantage of some of the cognitive and psychological processes that are occurring towards the end of the conversation. Towards the end of an interview a large number of interviewees are deciding one way or the other whether or not to tell you that extra 2 percent of information that might be critical to the success of your interview. Transition: An interview from our perspective is always part of a bigger process. The information that is gained from the interview needs to be integrated back into whatever process you are working from. This is typically where case files are completed, reports written, databases and organizational systems populated all with the relevant information from the interview. The function of notes and recording technology plays a role in this stage. We hope you enjoy the experience that we intend for our website. We do not intend for it to be a sales tool. We do not believe it should convince you that we are the answer to your problem. We want it to be somewhere for you to see if we are worth your interest and effort. If you are interested and prepared to expend a small amount of time, contact us and we will come and meet with you. We have the research, the applications, the people and the nerve to help you improve in entirely new ways.